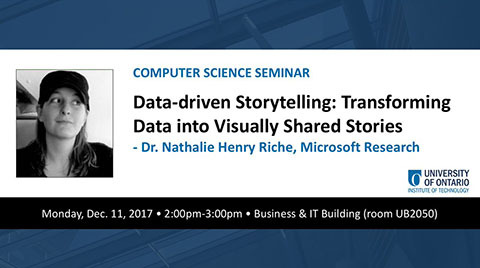 Abstract: In this talk, I will present my most recent research efforts in the field of information visualization and data-driven storytelling. While most of the research in information visualization has been focusing on designing and implementing novel interfaces and interactive techniques to enable data exploration, data visualizations also started to appear as a powerful vector for communicating information to a large audience. Stories supported by facts extracted from data analysis (e.g. data-driven storytelling) proliferate in many different forms from static infographics to dynamic and interactive applications on news media outlets. Yet, there is little research on what makes compelling visual stories or on how to empower people to build these experiences without programming. I will present insights from projects focusing on two different genres of data-driven stories: animations and comics. I will conclude the talk by reflecting on challenges and opportunities in this new research field. Bio: Nathalie is a researcher at Microsoft Research since 2008. She is a team member of the EPIC (Extended Perception, Interaction, &Cognition) research group led by Ken Hinckley. Nathalie holds a Ph.D. in computer science from the University of Paris Sud, France; and University of Sydney, Australia. She published her research in leading venues in Human-Computer Interaction and Information Visualization. She has received several best papers nominations and awards for her research and is involved in the organizing and program committees of major visualization and human-computer interaction conferences.